Home › SEO › Do Content Keywords in Google Webmaster Tools Affect Search Rankings? Admittedly, I spend way too much time in Google Analytics and Google Webmaster Tools. I can tell you the exact number of search visitors I received to my website(s) on a specific date. Yes, I have a problem. Fortunately, that problem greatly helps me to better understand how the Google algorithm works. Tonight I was plugging away in Google Webmaster Tools and I started to analyze the content keywords for several websites I run and manage. These websites range from social media to personal injury law to golf to orthodontics. As you can clearly see, this is a wide range of data. Time and again, those I respect in SEO and internet marketing have expressed that Google has a topical authority aspect to their algorithm. From the above chart, it would make sense that I would rank for keywords related to social, google, media, business and search. Take a wild guess what I tend to rank very well for. Waiting… Waiting….. Yep, you got it. I rank extremely well for anything social media, search, google and business. When you combine these keyword combinations I dominate my competition. By clicking on the content keywords in Google Webmaster Tools you are able to see how many occurrences these keywords show up on your website. After crunching the data for my website and my client’s business websites I am making the prediction that 1000 occurrences on your website will make you a topical authority. This is a complete hypothesis but it seems to be true across the board, even for more competitive industries like personal injury and orthodontics. So, what does this mean? It means that you need more content on your website! If you want to rank for Raleigh real estate agent you need to naturally use the words Raleigh, real, estate and agent on your website. Do not spam these keywords! I know what some people are already thinking. “Well, I could make a signature at the bottom of all my blog posts that says I am a Raleigh Real Estate Agent.” While you can do that, you should first create amazing content that naturally uses these keywords. Pro tip: comments are content on a page. If you write a blog post that gets hundreds of comments with the word Raleigh in them it will be more occurrences for “Raleigh” on your website. I have a blog post that received over 1200 comments for “invite” and I now rank very well for keyword phrases with “invite”. As SEO “experts” continue to hypothesize as to what is a ranking factor with the Google algorithm I can promise you one thing: content will always be king. There is a reason Google Webmaster Tools has a section for content keywords. There is a reason I suggest a WordPress blog to all of my clients. There is a reason the websites that have more comments rank higher. The more quality content on your website, the higher it is going to rank. There is no magic SEO pill that will cause your website to jump to the front page for specific keywords. If you struggle to publish content to your website feel free to reach out to me at jwojdylo@gmail.com. I have several monthly content packages that can help your business rank on the front page of Google search. I also have packages that can help you with all forms of Internet marketing. Contact me today. 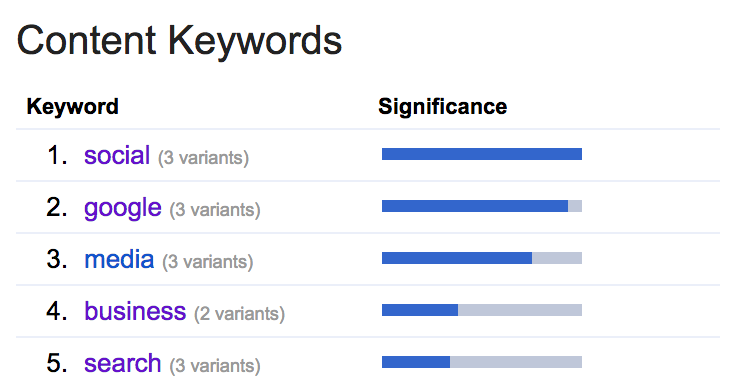 So… are we going back to keyword density? Mike, I would not look at it as keyword density. I am certain some people would read it this way. I would think of it as natural keyword usage within the context of a website. Jesse (and I) operate some sites (ours and client sites) which have become pretty powerful. A hypothetical example would be a auto repair shop in Charlotte. After putting up hundreds of pages of unique content over a year, the domain itself tends to rank extremely well for a thing and a place, such as “auto repair” and “Charlotte”. Not only will the domains be #1 for the targeted term, they will start to rank for things we never once mentioned related to this thing or place. One example would be: Transmissions Charlotte. Another would be: Auto Repair Lexington (a nearby city). They will rank for this even though the words transmission or Lexington have once been mentioned on the site, and nobody as ever linked to them with these anchor text links. One of my oldest, most powerful domains has done this since 2004 (purely on accident). So, it is nothing new- it is often easy to miss though, as most powerful domains also have plenty of links to them or content on them for things that they rank for. The only thing these sites appear to have in common is the amount of content on the site. The content has always been high quality content, trickled in on a regular basis, and completely unique. Jesse and I have attempted to come up with various theories for this. I personally call it a “Topical Authority Domain”. As Jesse points out, the # of occurrences do seem to play some sort of a role. A very, very low competition niche, like selling purple frogs on the moon, would rank with 1 single occurrence. For most niches, the 1,000 # seems pretty accurate, since most people aren’t willing to put content on their site in a consistent manner. This is just one of the many benefits of having a boatload of content on your site. Thank you for sharing your experience with Google Webmaster Tools. I will surely implement this with my SEO. I handle a few blogs in which we use sharing buttons and follow us buttons. Articles are about a whole load of different topics, so I always get in top 10 words like: share, follow, facebook, twitter, linkedin and google+. I wonder if there is some way to let google know that those words arent really inside the content.